I am using the WebTab control (v16.2) in our application. 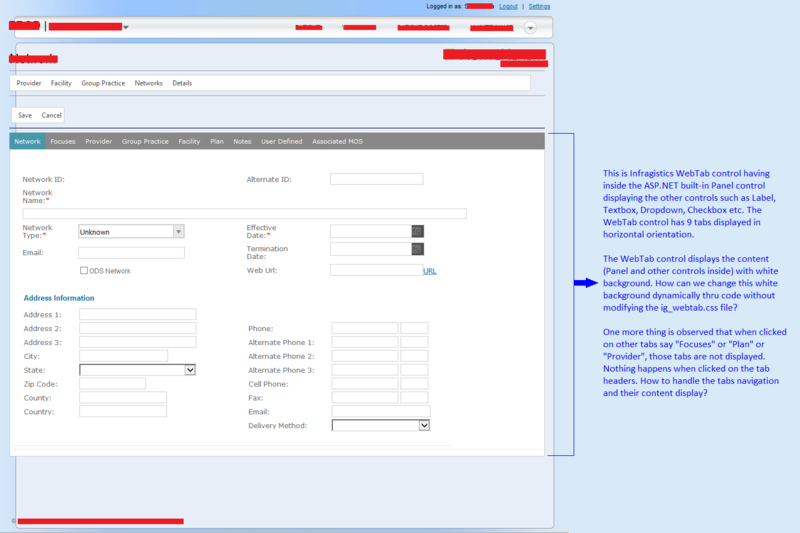 Here below is the WebTab control defined in the .ASPX page. <AAI:WebTab id="PageTab" runat="server" Height="280px" DESIGNTIMEDRAGDROP="833" DisplayMode="Scrollable" Width="940px"
When ran the application, the WebTab control displays the content with white background color. Please see the attached snapshot for details. How can we change the WebTab control background color without modifying the ig_webtab.css file that comes with Infragistics controls. I want to set the WebTab background color to transparent (or some other color) thru code dynamically as we have a requirement to display the tabs in different colors on different pages. I tried with some options to set the background color, but they did not work. Could you please let me know how to set the overall WebTab (or each Tab) control background color thru code (at run time). Also I have observed that nothing happens when clicked on the individual tab headers. I understand that, when user clicks on any tab header, the corresponding tab content will be displayed. But this does not happen in my implementation. Is it not the default behavior of WebTab control? If not, please let me know how to display the corresponding tab content when the user clicks on its header. If possible, please provide a sample application for the above two functionalities so that I could go thru and implement in our application. Thanking you in advance. I am glad I was able to assist you! If you need anything else with this, please let me know.